Boerum Pl and Schermerhorn St. Pure Vision Arts collaborated with The New York Transit Museum exhibition Transit on the Spectrum: The Art of Pure Vision. Transit themed art by Pure Vision Arts’ artists was on view as well as a new documentary short based on PVA by Lauryn Siegel and THEY Bklyn. 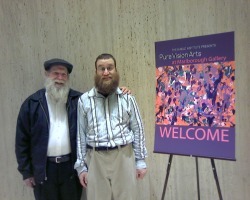 Shmuel was one of the artists featured in the documentary. On November 29, 2013, Pure Folk, Pure Vision Arts 10 Year Anniversary was celebrated at the American Folk Art Museum. Well attended, PVA’s artists’ paintings were exhibited alongside the American Folk Art Museum masterpieces. Director Pam Rogers welcomed guests calling the landmark anniversary, “a dream come true, “and PVA artist Shmuel Taurog took the podium to tell the crowd how much Pure Vision Arts has meant to him since he began attending the studio in 2003. It was a joy filled celebration with many loyal supporters in attendance, among them staff of major sponsors, The Capital Group Companies and TD Bank who could be seen chatting with the artists and discussing their paintings. Many thanks to the staff of the American Folk Art Museum and everyone who contributed to the success of Pure Vision Arts’ 10 year milestone.